Everyone has a story. We are listening. Along the journey of the Flint Stories Project, we have had the privilege to call many more people our friends. Dale is someone we were honored to call our friend before the project even started. His story is one we got to know over months of cookouts, dinners and conversations. But when sitting down with him to document his story, there was still more to learn. With Dale there is never a dull moment. He’s someone who seems to know how to fix everything, who you can count on for a good joke … or two, who wants to help anyone who needs it and who, for most of the year, is recognizable for his well-grown beard. 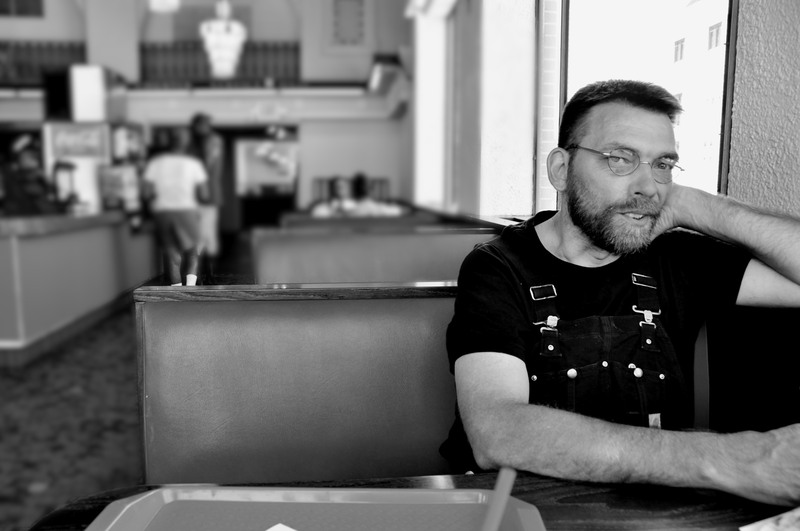 When I first met Dale at a Flint Community Cookout, he was introduced as “Beardy.” He was homeless living in downtown Flint and had a sense of humor that instantly made me want to get to know him more. (Although that humor usually came with some wise cracks toward me). Soon after that he found housing out in Mt. Morris and a friend and I made sure to make regular visits for dinner and catching up. So when asking Dale if he would be willing to share his story for the Flint Stories Project, his response was “You already know it.” Well, yes, that’s true. But it was never written down. Until now. Dale sitting at Halo Burger in Flint in 2012 while helping with a youth group event. Dale is soft spoken until you get to know him. Then all bets are off. His stories are entertaining and there’s no way to be in a bad mood when you’re with him. Dale’s life hasn’t always been easy. But no matter what he finds a way to move forward. He grew up in Otter Lake with his parents, two sisters and one brother. Dale was the middle child and didn’t have fond memories of his childhood. Loving parents wasn’t something he knew. At age 15 his mom kicked him out of the house during the winter. He stayed at friends’ houses or slept in vehicles. At age 16 he received his GED. Dale is one of the most resourceful people I know. He can live on the bare necessities. In fact, I often think he would choose camping over anything else. To say Dale doesn’t like to stick to one place for long is an understatement. “It was beautiful out there waking up to the mountains,” Dale recalled. With almost all of Dale’s adventures, he could always remember details of the scenery and the nature. After returning to Coleman when his grandpa got sick, Dale soon left for Georgia, where he wired houses for a year and half with his sister and brother-in-law. He had other various jobs, such as a carnie for a carnival company out of Saginaw and working in different plants. Dale then worked in Farwell for 12 years making the foam seats for GM seats. He had seven years of perfect attendance, working 10 p.m. to 6 a.m. often working more than five days a week. One night in 2005, he was riding his bike home from work on a bike trail and didn’t see a trailer sticking out onto the path. He was thrown from his bike, later realizing he broke his collar bone. “I knew then I was going to lose my job,” Dale told us. He was supposed to have three weeks off, but after a week and a half he was called back in. And he didn’t have any other choice. He had to work to keep his insurance. In 2007 Dale lost his job. In 2008, Dale lost his house. He moved to Florida until 2009 before heading back to Michigan, where he camped up north for three or four months, putting everything he had in his trailer. It was after that in 2010 that Dale came to Flint, because he knew the city had the resources he needed. Once in Flint, Dale slept in his truck before learning of a shelter to stay at. He had some money in his pockets after eventually getting a small settlement from his job. He never “bummed off money.” And he did odd jobs when he could, but learned to use his money wisely for food. Not being able to work was hard for Dale. “I hate sitting around,” he told us. And once you get to know Dale, you know how true that is. Dale stopped drinking completely in 2007. His parents were alcoholics and when he started going down that same path he made the decision to give it up. Being homeless and on the streets, Dale quickly figured out how to best utilize the resources Flint had to offer. And when he realized other people didn’t quite know everything that was available, he took it upon himself to help them out. There was a yellow book from The United Way that helped show people where to get a hot meal, a shower and food give-aways. “It had all the resources a person could ever need,” Dale said. Dale reminded us of something important. Not everyone who is homeless has the same story, the same reason. And it takes our time to realize that. Yes, there were some homeless in Flint that were alcoholics, addicted to drugs and lazy. But that was not everybody, Dale said. Those living on the streets formed a community, looked out for each other. Flint wasn’t a place where the homeless went hungry. In fact, if you were hungry you were doing something wrong, Dale said. “(The worst part was) being cold, feet being miserable,” he told us. And the boredom. In 2011, Dale had his first surgery on his collar bone to help it heal correctly. In 2012, he had to have another surgery with little relief. After two years of being homeless, he finally received housing assistance and started receiving Social Security. “It was nice to have a home again,” Dale said. He still tried to work at odd jobs whenever he had the opportunity. Dale isn’t one to take something for nothing. For the past six months or so Dale has been working on piecing his old truck back together little by little, because he is ready for the next step in life, which, sadly for us, might not include staying in Michigan. It shouldn’t be surprising, but Dale is ready to move on to bigger and better things. A new location down south is on his radar. He’s learned a lot during his time in Flint and met a lot of people along the way. If he had never lost his job, Dale would have still been working and close to retirement. Now he’s figuring out the next best move for his life. If he had it his way, he would have farm land where he could grow his own crops and live off the land. It’s been a privilege getting to know Dale over the years. He perseveres and pushes through whatever life gives him. When you are around him, you can’t help but enjoy life. And we are happy to call him friend. He’s just one more example of how you can’t judge someone by their circumstances. Thank you for letting us share your story. This is the seventh story in the Flint Stories Project. Please continue to check back for more stories. Feel free to contact us at Flintstories@gmail.com.